I’m looking forward to getting everything done because if you don’t know already, I am a major procrastinator and I always have something hanging over me to do. This is probably the earliest I’ve ever written a blog post and I knew that I will feel a lot better having everything finished later on and won’t have to think about all the stuff I have left to do at eight or nine in the evening. I know everyone’s heard the saying “the early bird catches the worm”, which is true but I found this quote by Jim Rohn that I thought really suited how I feel today. I’ve spent the whole of January waking up late and feeling like the whole day was practically over and I didn’t have time to get anything done, but once you get past that horrible few seconds of actually getting up, you will feel a lot better knowing that you have the entire day ahead of you. 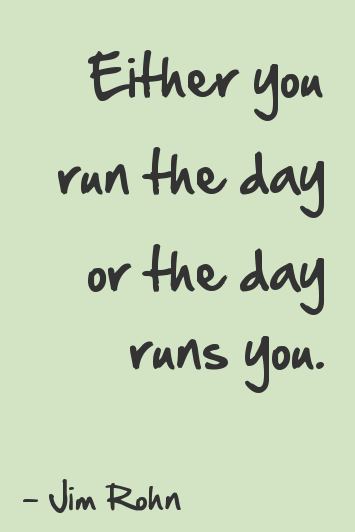 Do you prefer to get up early and get everything done? Or can you not even lift your head from the pillow before noon each day? I’m definitely not a morning person but I’m starting to wonder if it’s possible to become one. Do you think it is possible to change the habit of a lifetime? Leave a comment below.